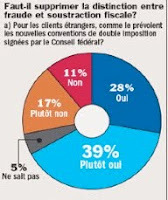 A survey for SontagsZeiting and Le Matin Dimanche in Switzerland found that Swiss people favour eliminating the "ridiculous" (as one Le Matin expert interviewee called it) distinction between tax evasion and tax fraud (which involves using false documents for deceptive purposes.) This is sensible. Less fortunately, Swiss voters want to keep bank secrecy, which has kept hundreds of billions of dollars of foreign dirty money under wraps (see latest Swiss estimates here, and our general page for worldwide estimates here.) They also rejected the notion of automatic exchange of information. Read more in French here, in German here, and in English here.